As far as doctors are concerned, Victor Frankenstein probably wouldn’t be your first choice for a weekly checkup. As an addition to your Penny Dreadful collection, however, this Penny Dreadful Frankenstein 6-Inch Action Figure - Convention Exclusive from Bif Bang Pow! will provide the prescription for what ails you. The finely detailed figure features the “not so mad-scientist” wearing slacks and a long sleeve blue shirt which is visible through his black sleeveless vest. This first ever 6-inch figure of the popular Penny Dreadful character features a whopping 18 points of articulation and includes the young doctor’s infamous sketchbook and surgical scissors as accessories. With a production run of only 2,800 pieces, collectors will want to grab this individually numbered and limited edition Entertainment Earth convention exclusive before it’s gone forever! Not attending San Diego Comic-Con 2015? 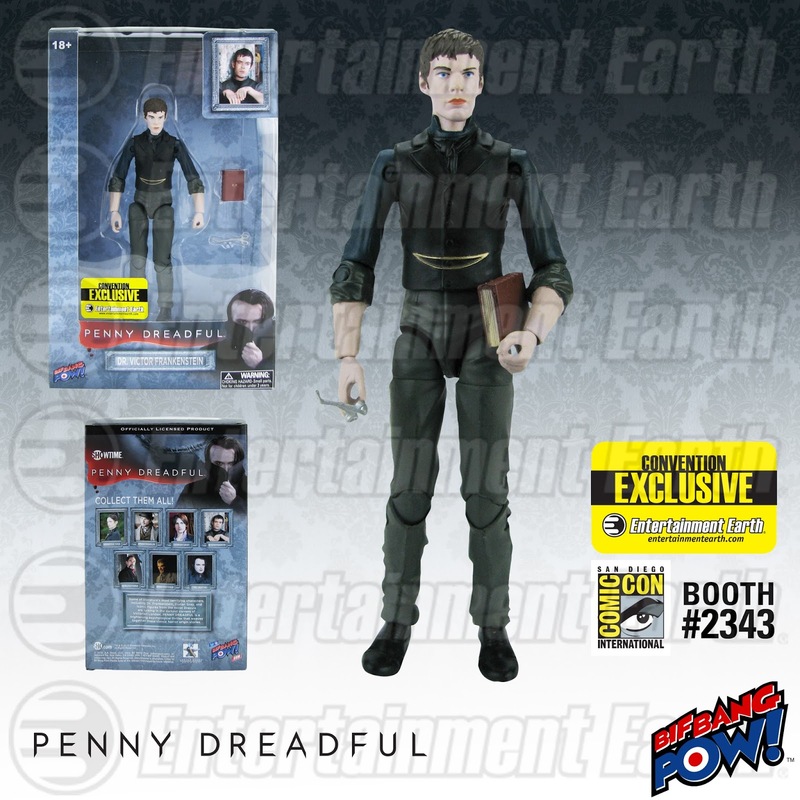 *PRE-ORDER your Penny Dreadful Frankenstein 6-Inch Action Figure - Convention Exclusive at Entertainment Earth now! Other Entertainment Earth exclusives include a Saturday Night Live Weekend Update Tina Fey & Amy Poehler 3 1/2-Inch Action Figures Set of 2, Adventure Time Traveling Jake Tin Tote Gift Set - Convention Exclusive, Batman Classic Chair Cape - Convention Exclusive, and more. Over 25 Entertainment Earth convention exclusives will be announced ahead of San Diego Comic-Con. Visit Entertainment Earth and all our social media networks for the latest Entertainment Earth and San Diego Comic-Con news. See more of our mysterious Penny Dreadful collectibles here!